The news that Speaker Paul Ryan and the House Republican “leadership” are moving a bill that purports to strengthen our government’s almost non-existent battle against domestic Muslim terrorism might sound good to most Americans – until they read the actual substance of the bill. Supposedly the bill, sponsored by House Majority Leader Kevin McCarthy, would force the Department of Homeland Security to prioritize efforts against radical Islamic terrorism, all good given that the Obama administration still refuses to acknowledge this threat to the American homeland. "In the wake of the Orlando attack, we must step up our efforts to combat the radicalization and recruitment of citizens by [the Islamic State]," McCarthy said. "The bill introduced today will provide more tools and resources to combat the spread of dangerous radical Islamist ideology and help our law enforcement agencies prevent future attacks on our soil." McCarthy's bill includes elements of several other bills that Republicans have offered. Perhaps most importantly, it includes language from House Homeland Security Chairman Michael McCaul, (TX-10) that would require DHS to create an assistant secretary position to fight radical Islamic terrorism in the U.S. The creation of this Assistant Secretary position is expressly aimed at forcing DHS to recognize this source of terrorist activity – radical Islam – and at forcing DHS leaders to name the threat directly and take action against it. The problem is that McCarthy’s proposition framing and identifying the enemy is shallow small ball compared to the actual threat to constitutional liberty posed by Islam. In reality, the Islamic State is a small, albeit savage and frightening, part of the worldwide jihad being conducted against Western civilization by Muslims. Concentrating on that one vector not only constrains our view of what and who the enemy actually is, it also empowers various presently non-violent, but subversive Islamist enemies, such as the Muslim Brotherhood and their various front groups like the Committee for American – Islamic Relations (CAIR), that are already working to penetrate and subvert our government and constitutional liberties. It’s as if American Cold War Presidents had ignored the world communist movement as the real and more lethal enemy of constitutional liberty and instead said “Communist Cuba is only 90 miles away, we have to focus all our efforts on defeating Cuba,” and then proceeded to invite supposedly non-violent communists to advise them on how to frame the battle. As our friend Frank Gaffney of the Center for Security Studies put it, under the influence of known Sharia-supremacist groups in America, e.g., Muslim Brotherhood/Hamas fronts like the Committee for American – Islamic Relations (CAIR), Islamic Society of North America (ISNA) and Muslim Public Affairs Council (MPAC), the federal government’s Countering Violent Extremism (CVE) apparatus has given priority to avoiding any offense to Islamists, rather than preventing their jihad. Federal agents, analysts and state/local police are being trained to remain ignorant of what motivates and enables the global jihadist movement. They are told that “right-wing” extremism is a greater danger than that posed by Sharia and jihad terms whose use CVE as formulated by Obama, Jeh Johnson and Mike McCaul actually forbids. This practice virtually ensures more Fort Hoods, San Bernardinos and Orlandos as our first lines of defense are effectively precluded from being proactive in the face of knowable threats. The goal of any new congressional initiative must be securing “Victory Over Jihad” (VOJ). 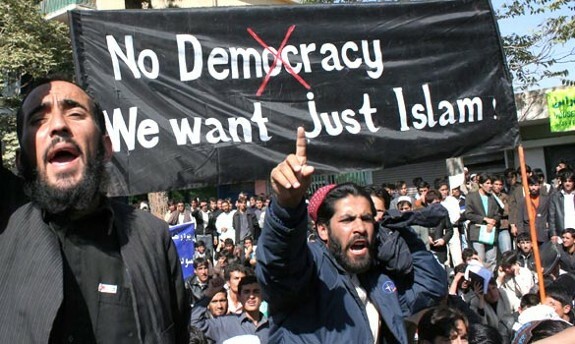 Those whose adherence to Sharia obliges them to strive to replace our Constitution with their totalitarian, supremacist doctrine are enemies, not “partners” just because they use pre-violent techniques for advancing this goal, such as subversive influence operations, lawfare, infiltration, migration, material support for terrorism, etc., rather than violent ones. “Community partnering” must be with anti-jihadist Muslims, not Islamic supremacists, such as the Muslim Brotherhood, CAIR, ISNA, MPAC, etc. Victory Over Jihad will require the sustained pursuit of a comprehensive, fact-based approach involving all instruments of national power at the federal, state and local levels and, wherever possible, the help of like-minded allies. We simply cannot afford to perpetuate what is, at best, official willful blindness and at worst, our first defenders’ unilateral disarmament by partnering with front groups who are simply pre-violent representatives of the same ideology held by the Islamic State.